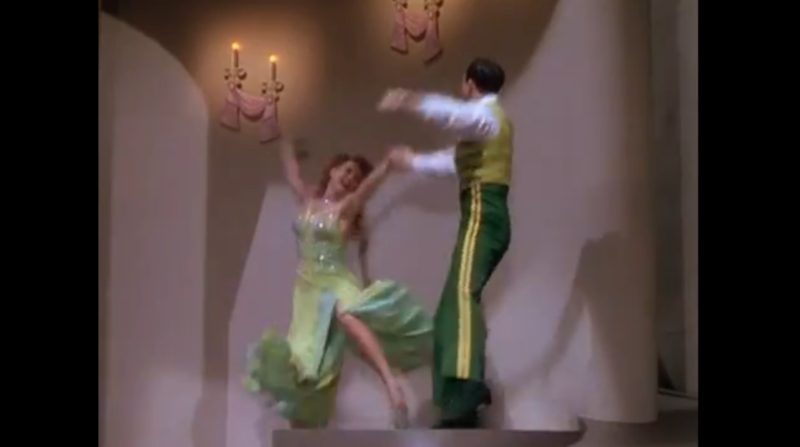 A dancer (Rita Hayworth) performing in a nightclub owned by her boyfriend (Gene Kelly) is selected as a new “cover girl” by a magazine magnate (Otto Krueger) who was once in love with her look-alike grandmother (also Hayworth); soon Hayworth finds her loyalties torn between Kelly and a young producer (Lee Bowman) who promises her fame and fortune. 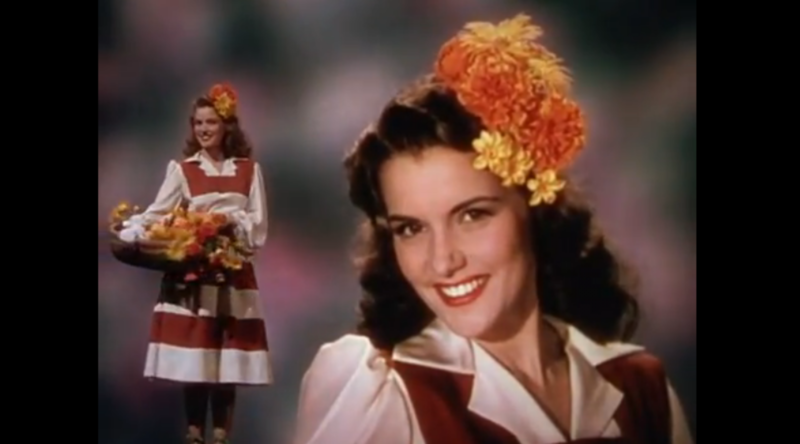 Rita Hayworth was a top box-office draw at the time she made this enormously popular Technicolor musical for Columbia Pictures. Unfortunately, its cliched storyline — revolving around Hayworth’s quick rise to fame, and the tension this causes in those she “leaves behind”, particularly her loyal boyfriend — isn’t innovative enough to hold one’s attention, and hasn’t aged all that well. Hayworth’s wealthy suitor (Bowman) is about as charismatic as a wet rag, and Kelly’s frustration with Hayworth’s desire to take a “short-cut” to success (made possible due to a silly plot contrivance involving her uncanny resemblance to her grandmother) seems uncharitable at best. Meanwhile, only one of the songs in Jerome Kern and Ira Gershwin’s Oscar-nominated score — the ballad “Long Ago and Far Away” — lingers in one’s memory, and this is likely due to its use as the film’s overall musical motif. However, Cover Girl remains worth a look simply to watch lovely Hayworth performing some fine dance numbers (she’s incredibly light on her feet), and to see Kelly’s “Alter-Ego” routine, in which he dances with “himself” — he purportedly labeled it “the most difficult thing [he’d] ever done, a technical torture”, but his efforts paid off, to stunning effect. 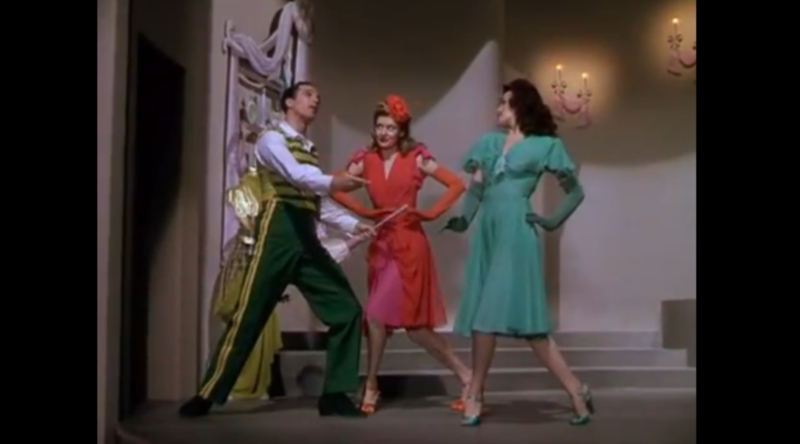 Watch for Eve Arden in a standard supporting role as Krueger’s wisecracking assistant, and Phil Silvers as Hayworth and Kelly’s annoyingly abrasive dance partner. No; this one is only must-see for Kelly or Hayworth fans. But it’s worth a look simply for the dancing. Not a must, but not a waste of time due to its plus-value. If you think about it right after watching it, you may find that – as an overall film – ‘Cover Girl’ is oddly forgettable. A major drawback is the story; there simply isn’t much of one. For the most part, I find the score rather engaging. (The exception being ‘Poor John’; I know it’s an homage to a certain type of turn-of-the-century tune, but it still bores me.) ‘Make Way for Tomorrow’ and ‘Put Me to the Test’ are immensely enjoyable (esp. as performed). ‘Long Ago and Far Away’ is indeed lovely and haunting. 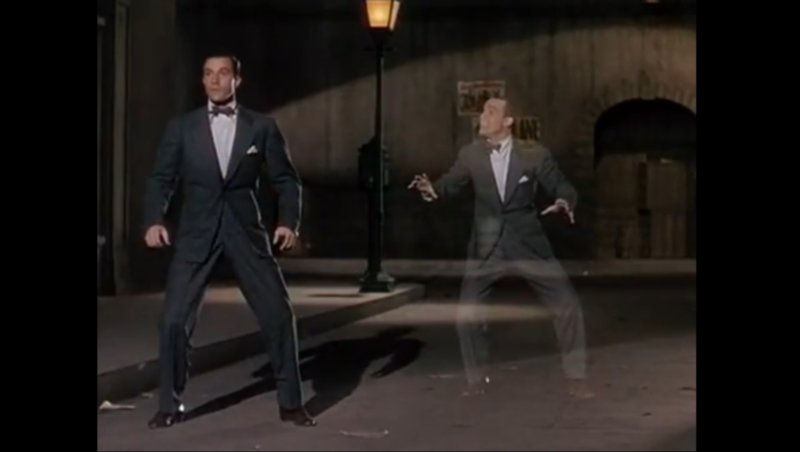 And the ‘Alter Ego’ sequence alone could be the main reason to consider watching the whole film. In some sense, Hayworth is doing a dry-run here for her re-teaming with Vidor two years later: ‘Gilda’. Hayworth’s Rusty and Gilda both long to be unleashed somehow (and both end up drinking out of frustration and the feeling of being trapped). Which is why, in ‘Cover Girl’, it’s thrilling to see Hayworth letting herself go when she finally glides around solo on a bare Broadway stage. It’s a stunning moment!